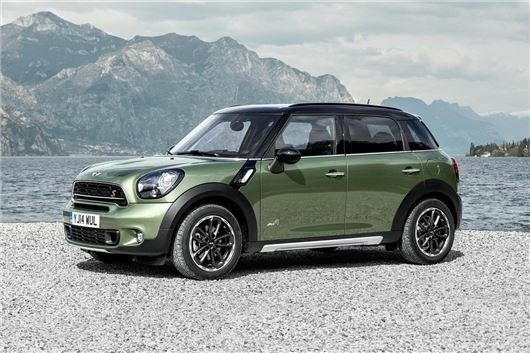 MINI has revised the Countryman with slight tweaks to the exterior styling and improved engines for better fuel economy. The revised car is priced from £16,990 and will be available to order from June. Exterior changes are subtle, with a redesigned grille the biggest and most obvious change. There are also two new colours on offer - Jungle Green and Starlight Blue – plus some new styling choices for roofs, door mirror caps and exterior trim elements. There are also new, lighter alloy wheels, LED running lights and LED fog lights. Most of the changes are beneath the metal – MINI has revised the Countryman to meet new EU6 emissions regulations, with improved aerodynamics and smoother wheel bearings to help reduce air resistance and friction. The Cooper S engine has been given a boost to 190PS, meaning a 0.1 second quicker 0-62mph sprint and improved emissions – down 4g/km to 139g/km. As before, the Countryman is offered with all-wheel drive in Cooper, Cooper S, Cooper D and Cooper SD trim. All models come with a six-speed manual gearbox as standard, with the option of a six-speed automatic gearbox. Standard equipment includes tyre pressure monitoring, day time running lights, DAB radio, Bluetooth, five-speaker audio Auxilliary audio input and rear parking sensors. Prices for the revised car start at £16,990 and sales start in June 2014.